There’s something special about college—a certain feeling, one that you get again and again throughout your life but never as strongly as you did while in school. It’s hard to explain, exactly, but it’s the thing that drives you to eat a half-pound of chocolate at 2 a.m. the night before your hardest final. It’s kind of a beautiful image: you, bent over your hand-written study guide, chocolate shavings carried down your face by your tears as you cry-eat-study your way to the next morning. There is nothing else like waking up in a half-conscious state, your face stuck to your desk by saliva-made-sticky with melted chocolate. This is what college is about, everybody. And it’s a rare kind of combination of shame and fear and indulgence, which is why we all need to make the most of those moments—after all, you’re only in college once. In the spirit of getting everything you can out of these late nights, your study snack needs to measure up. Do you really want to look back on your four years here and remember the sub-par Weshop chocolate bars you ate long into the night, their wrappers forming a pitiful circle around the base of your chair? Or do you want to be able to recall, proudly, the inconceivable amount of homemade toffee you shoveled down during your second crying fit of the week? Oh, yeah. This is a recipe for toffee. Was that not clear from the start? Line a cookie sheet with foil and grease (non-stick cooking spray would be my recommendation, but use what you have to make sure the toffee lifts off easily). Arrange saltine crackers in a layer across the cookie sheet. Combine butter and sugar in a saucepan until the mixture boils. Boil for another three to five minutes, or until it starts to foam. Pour the mixture into the cookie sheet, being sure to cover all saltines. You can use a spatula in order to spread it from corner to corner. Remove from oven and quickly sprinkle chocolate chips on top to melt them. Spread the chocolate to coat the surface of the saltines. Again, a spatula is helpful here. Refrigerate until fully cooled, then break into pieces— either with a knife or by hand, which is way more fun. That’s it! 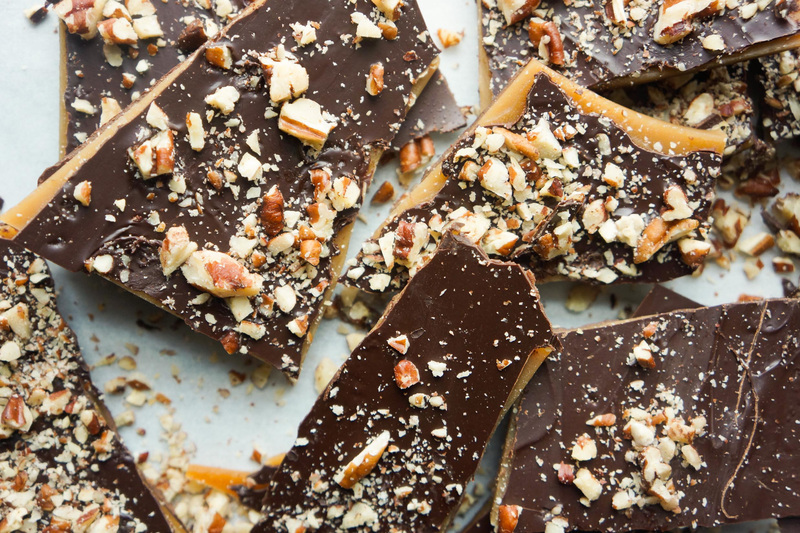 Toffee is great to keep your brain going or to nibble on mindlessly while binge-watching Netflix. Following this recipe is deceptively simple, and all of the necessary ingredients can be found at Weshop. Listen, I know that the whole saltine thing sounds kind of strange, but once baked, they create that salty-crunchy base that you remember when you think about toffee. This recipe is also great without walnuts, if you are one of the select people out there with a tree nut allergy. Don’t fret, because you aren’t missing out—the main draw here is the sweetness of the chocolate offset with a little saltiness. The whole process (save cooling) will only take you about 20 minutes, so this is a great quick study break when your eyes stop working right. Once the whole thing is cooled, it is really easy to break into pieces and store, giving you the perfect easy-access sweet stash for whenever you feel like you need it. Remember to study (and eat toffee) responsibly. Don’t steal your roommate’s study snacks; don’t buy Weshop out of chocolate chips to satisfy your toffee craving; don’t leave everything to the last minute so that you need four batches of toffee to get you through the week. As beautiful and as deeply “college” as those late night study sessions are, you really do have to take care of yourself. Plus, if you’re not pulling all-nighters every night, you’ll be able to space out your toffee consumption a little more evenly. It really all comes back to the toffee. So be good to yourself, and make it last at least a few days. Good luck, study safe, and stay full.